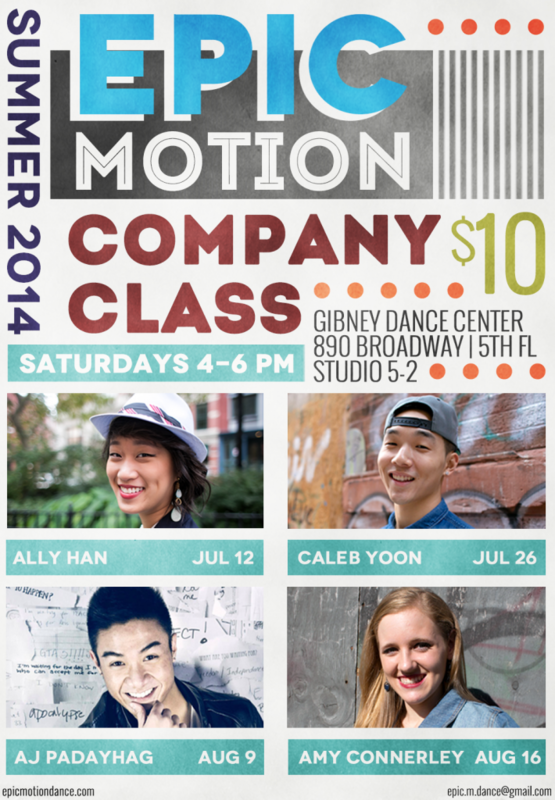 EPIC Motion Dance Company is pleased to announce the return of our summer Company Class series! Please join us as members of our company share their unique styles with the community. It’s going to be a great time! Please email us at epic.m.dance@gmail.com or message us on Facebook if you have any questions or concerns. Every New Yorker has a story to tell; different joys, trials, musings, and relationships. We all have choices to make, and it’s the way we respond that makes us unique. But when it’s all said and done, we’re all humans. Everyone only gets 24 hours in a day. 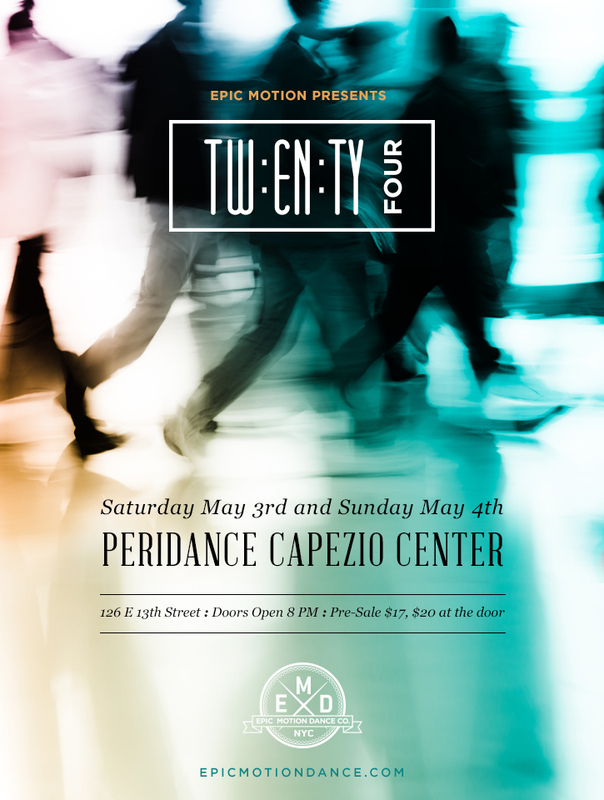 EPIC Motion Dance Company is proud to present its fourth annual Spring production “TwentyFour.” Each year our show is a highly-anticipated event that has consistently sold-out, so purchase your tickets early. Join us for a night of inspiration and witness the artistic vision and creative works of our company. Follow the hashtag #NYTwentyFour on Twitter, Instagram, and Facebook for updates on the show! 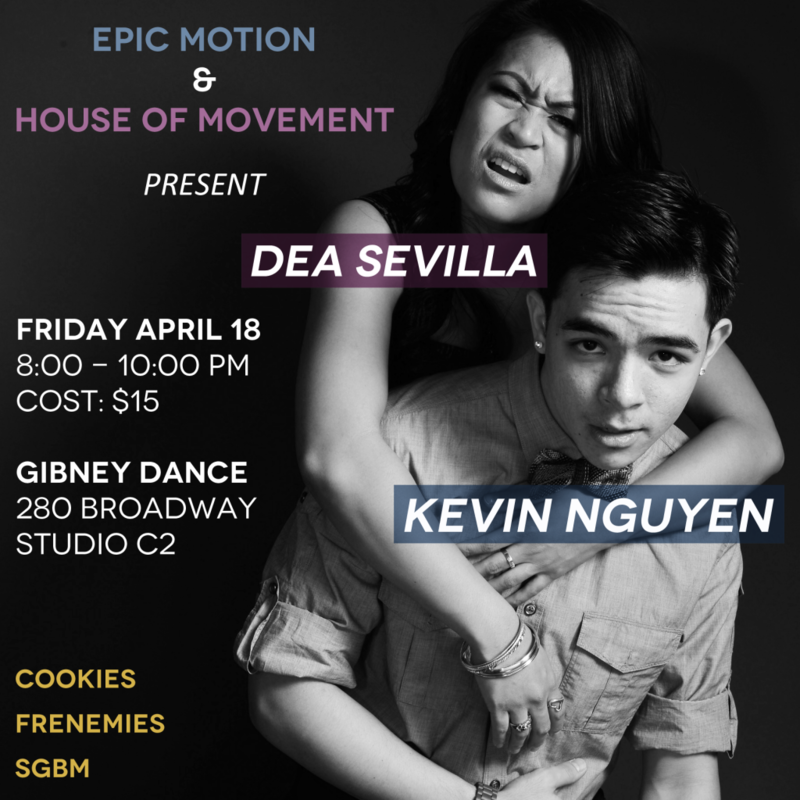 Dea Sevilla and Kevin Nguyen from Cookies﻿ are soon to be back on the East Coast, so EPIC Motion Dance Company is teaming up with House of Movement﻿ to host another collab workshop! Please email us at epic.m.dance@gmail.com or message us on Facebook if you have any questions or concerns. We look forward to dancing with you! Chaldea “Dea” Sevilla is a dancer and choreographer who has been training since a young age, in various styles such as ballet, tap, jazz, hula, and Polynesian around San Diego, CA. Introduced to the hip-hop dance community in 2004, she joined Future Shock San Diego under the guidance of Belle Abuyo and Rainen Paguio. Dea furthered her training with NYR, Funkanometry SD, Boxcuttuhz, and Super Galactic Beat Manipulators. Dea is now happy to call Cookies (formerly known as Choreo Cookies) home and is also a current member of Frenemies. As Dea continues to grow as a dancer and choreographer, her hope is to inspire others; teaching dance abroad as well as with StudioFX and Signature Dance Academy. Dea feels blessed on her path and looks forward to whatever lies ahead. 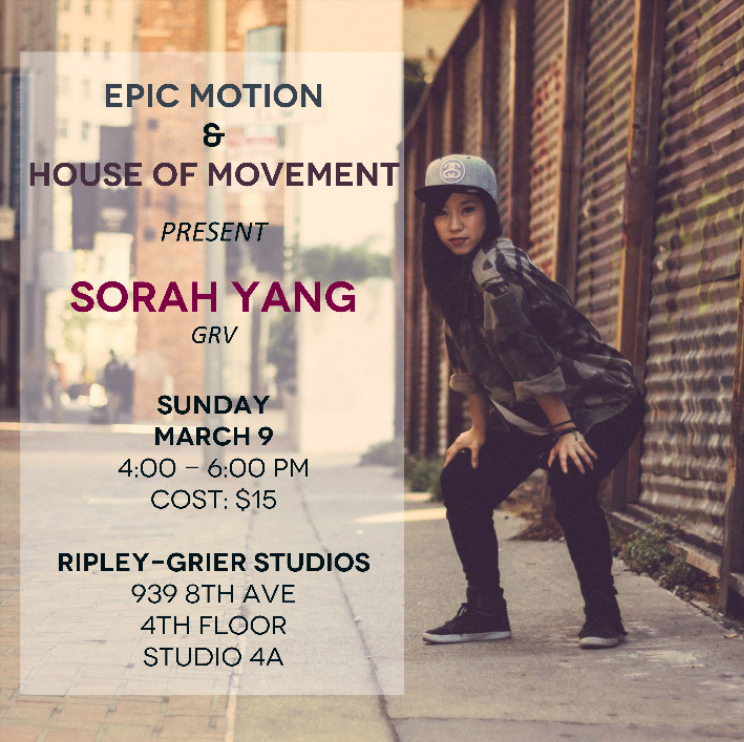 House of Movement and EPIC Motion Dance Company are very proud to announce that we will be having Sorah Yang here in New York City for a special workshop! Sorah Yang is a singer, dancer, choreographer, and teacher. Born and raised in the Bay Area, she moved down to LA in 2009 for school and received her Bachelors in Business Administration from USC in 2012. During college she joined GRV, and has performed on stages like World of Dance LA, The Bridge, Body Rock, Fusion, Vibe, Hip Hop International, Carnival Choreographer’s Ball, and The Hip Drop. While she has been teaching at studios and workshops around Northern and Southern California for the past 6 years, within the past year she was fortunate enough to travel to teach in Hawaii, Virginia, Germany, Russia, and Korea. Sorah believes that her journey to spread joy, empowerment, and positivity through dance is just beginning, and strives to continue to grow and learn as a student so she can progress as an instructor and give back as much as she can. Want to be a part of EPIC Motion? We’re seeking a few more dancers to join us this season through invite-only auditions! New members will have the opportunity to not only train with us but also perform in our annual spring showcase production. Send a video of your best work as a dancer and/or choreographer to epic.m.dance@gmail.com (Subject: EPIC Motion Mid-Season 6 Auditions – YOUR NAME) as well as complete the application. Both the video submission and application are due January 4, 2014 at 11:59 PM EST. Your materials will be reviewed and you will receive an invitation email by January 5, 2014 January 6, 2014. Please note that those invited MUST be available to audition in person 6-9 PM on Saturday January 11, 2014. We’re excited to see what you have to offer! Please email us with any question or concerns.